Well, finally, let me share with you some of the pictures I took at the Houston Quilt Market. Here's me with Amy Butler. I have been a fan of her work since her first line of fabric with Free Spirit Fabrics..Gypsy Caravan...can out. I have sewn so much with her fabrics over the years. Probably the most of any individual designer. I'll share some of my past designs with her fabrics in an upcoming post. So it was a great pleasure to meet her...certainly the highlight of the show for me. She always does such a great job of conveying a positive and energetic atmosphere with her work. And I'd go so far as to say she really started this revolution we have seen in the last 5 years or so of really contemporary, modern quilt fabric design that has really allow the market to tap into a younger audience of sewers and have brought many new folks into the sewing and fabric design arena with her work. I am looking forward to seeing her again next year. 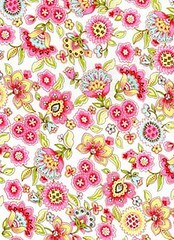 And looking forward to carry loads of her new fabrics on my website! Here I am with another sweet lady...Anna Maria Horner. I became an instant fan of her work when she came out with her first collection with Free Spirit Fabrics, Bohemian. It was launched just as I was moving to Germany, so I was not able to get an order in before I left and had a hard time finding it in Europe. So I did not play with it as much as I wanted to. I have enjoyed all her latest collections. And now that I am back in the US, I am so excited to be able to easily get ahold of her prints. She has such a unique and great color sense. She had images of her new collection....it is a winner for sure. She's even bringing back some prints from Bohemian...yeah for that. Her work is definitely drool worthy. I also picked up her book..s.he was doing a book signing. I have not looked through it all yet, but even at first glance, I know it is a winner. The cover is gorgeous. The pages are gorgeous. And the projects look super fun! 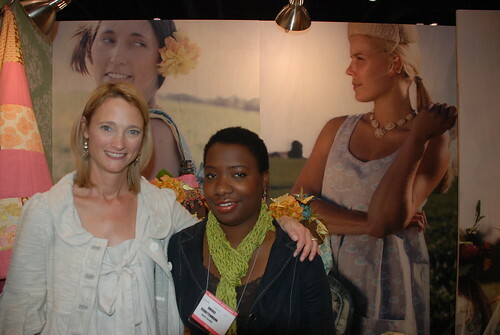 Here's Anna Maria with Verna Mosquera, another designer with Free Spirit Fabrics. Verna was super nice and had such a sun-shiny disposition. 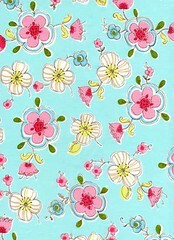 I ordered some of her new line of fabrics as well! Okay, next up Jay, of project runway fame. He was so fun. I picked up super cool vibes from him. Can't wait for his fabrics to arrive at my doorstep! And here is a picture of Kaffe Fassett and one of his collegues, Lucy Prior (thanks for sending her name my way, Di!). I can't remember her name...I'll have to look this up. She was so friendly. They both were. But I have slightly nervous, I have to admit. I have been a huge fan of Kaffe's work for years...both his fabric and quilting, as well as his yarn and knitting. I really wanted to pitch a book idea to him, but chickened out. Maybe next year!lol I ordered a bunch of his new prints as well. His colors and prints make me smile! Next up are some pics of my blogging and ebay buddies. This was my first time meeting these ladies...meeting anyone from the internet actually. I was nervous...you never know if you'll hit it off in person. But these girls have a place in my heart now. Here's Mary. She makes some adorable clothes for Paula Prass' booth. There is something about Mary. She is super talented, super crafting, very giving, super knowledgeable and just plain fun! I can't wait to meet up with her next year!! I wish we lived closer, because she is definitely my kind of girl. And here's Traci of Bloom Design. She also made some adorable clothes for Paula's booth. Traci and I did a guest launch together years ago on ebay. She is just as sweet as she looks! What a fun and super sweet girl. and super talented. I'll have to convince her to make me one of those schnazzy badge holders, like the one she is wearing, for next year! Finally, here is Jenn. She also worked with Paula...her clothes were just adorable! And again, Jenn was just as fun and sweet as she looks. Okay, I have to wrap this one up. I'll be back tomorrow or the next day to share some of the goods from market. And to start a blog giveaway. I collected extras of lots of the giveaways so I could share them with my blog readers and mailing list folks. This will be fun! Have a Happy Day, People! Oh, and don't forget to get your vote on tomorrow! Go here (www.vote411.org) to find out where you need to go to vote so you don't go to the wrong place tomorrow! OK, you're right Sheree..I am SO going with you next year. So much awesome inspiration! For those of us design geeks these people are like rock stars! lol!! I'm so jelous... I wish I was there with you!!! It must be amazing. Meeting so many talented people. Is that Lucy Prior with Kaffe? Looks like you had alot of fun. It was awesome to meet you. You were so kind to loan us hangers!!! Thanks for your wonderful smile and great enthusiasm. Keep in touch. Wow, awesome photos. I'd love to see more. Now I want to be a fabric designer when I grow up-lol. Lucky you. Maybe I'll get to Quilt Market one day. Pfffffft. There's something about SHEREE!! Oh, girl, it was awesome to finally meet you and I wish we could have hung out more! Thanks for being perfectly *you*! xoxo, me! Hi Sheree. I wanted to tell you how fun these pictures are. Thanks for posting them. And I agre that beautiful fabrics like Amy Butler's are what has fueled the crafting renaissance. I know I had mostly fallen away from sewing because I was so unhappy with the fabrics I was finding at fabric chains. Now all that has changed with new designers and online fabric stores. Love all the photos. Look how super cool and beautiful you look. Don't forget I live in Pittsburgh. You lucky girl! Such an awesome event to network with people with your passion! Hopefully you got lots of ideas and inspiration. I am so bummed that I didn't get to go to the 2.0 party and meet yall. Since you are a Texas gal now and don't live very far from me, we will definitely have to get together! !